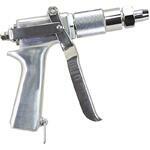 This spray gun is perfect for any tree and shrub application. It features an adjustable stream that goes from a fine mist to a long distance pencil stream. Dad will appreciate the heavy duty quality and the 800 max psi. The Greensmaster JD9-C uses the same nozzles and repair kits as the Green Garde JD9-C, making it highly versatile and customizable. Sprayer Depot stocks several parts for this spray gun, making it easy for Dad to switch things up down the road. Durable construction and "super swivel" capabilities make this 1/2" Hose Reel Super Swivel a handy product for the Hannay 1500 Series or Titan 4300 and 5500 Series Reels. 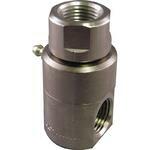 It's rated at 5000 PSI, and perfect for liquid deployment in commercial, agricultural and industrial applications. Hypro pump models 9910-D30 and 9910-D50 need this Hypro GS40GI Control Unit/Regulator for smooth, consistent sprayer functioning. This unit comes with a pressure gauge, one complete bypass level, a 3/4" HB bypass and two 1/2" HB outlets. Add the 9910-KIT1741 for the ability of remote mounting. This spray gun is great for deploying liquids in agricultural and landscaping applications. A heavy duty spray gun that's capable of withstanding pressures up to 800 PSI and flow rates of up to 48 GPM. If Dad needs to deploy liquids into tall trees, this is a great gun for that purpose. It can shoot a fine mist to a solid stream with a simple twist of the wrist. Orders over $100 enjoy FREE Shipping, so grab these items and show Dad some appreciation! Act fast - quantities are limited.